Diamonds are a girls best friend, right? The good news is that Tanishq has launched a new range of jewelry and the best way for the ads to grab everyone’s attention is by having a star do it. Deepika Padukone looks gorgeous in the ads for the ‘Queen Of Hearts’ Collection. Tanishq’s latest collection is the epitome of grace, elegance, and beauty. The patterns are not just delicate, they are at their sparkling best for all the ladies who love gem stones. One word that sums up the this collections appeal is royalty. Let’s check out the outfits she wore for the adds, which are chic! 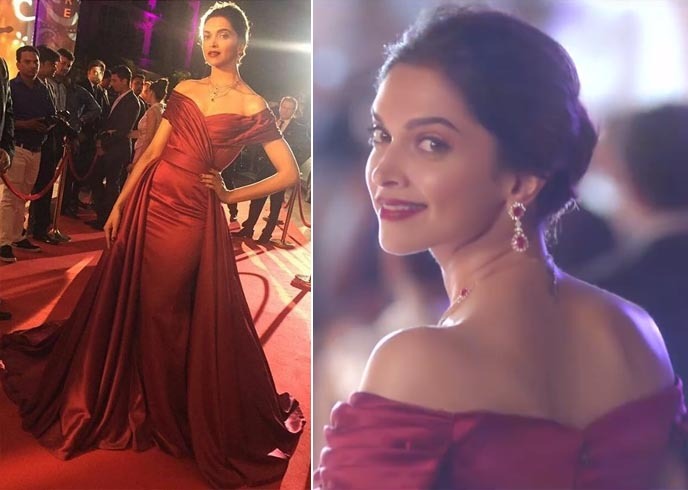 Deepika wore a Monisha Jaising gold outfit complimented by a set of ruby and diamond earrings and necklace. As for the makeup, she wore red lip color while her hair was tied in a pony. In another Monisha Jaising creation, she wore a diamond and emerald set. The choke chain with the dangling earrings are graceful. Another look for the ad was one the one in which she wore an off shoulder gold embellished outfit along with diamonds and rubies. For the next look, Deepika wore a pink Falguni and Shane Peacock outfit. And the necklace with diamonds and rubies completed her look. Deepika looked fabulous in a lavender Abu Jani Sandeep Khosla outfit. The gown with ruffles and a tail went well with an elegant necklace from the ‘Queen of Hearts’ Collection. Another outfit the star wore for the ad was a red Swapnil Shinde gown. The jewelry added some sparkle which made the star look regal and elegant, like royalty. In case you haven’t watched the advertisement, here it is!